Were You Stopped For Illegal Gun Possession At LaGuardia Or JFK? Many individuals who own firearms are familiar with their state’s particular gun laws and abide by them. However, these individuals can run into trouble when attempting to bring their weapons into New York. It is not an understatement to say that New York has some of the toughest firearm laws in the United States. Even if you have taken the time to research and obtain the proper permissions for traveling with a gun in New York, chances are you may experience problems and perhaps face allegations for illegal gun possession upon entering the state or New York City. If this happens, you need strong local representation to defend your rights. At Goldberg & Allen, LLP, our attorneys have the familiarity and experience to help you. We understand the significant consequences of conviction of weapons offenses. We will examine all of your options and vigorously pursue an outcome that protects your best interests. Most people who travel to New York City on business or for vacation are not aware of New York’s strict gun laws until they arrive at LaGuardia or the JFK International Airport. Upon arrival, they may be pulled aside, searched, and then arrested by security officials for having a firearm concealed on their person or in their luggage. It is important to understand that even if you have followed federal law and acquired the appropriate documentation for declaring and traveling with your gun, you may still be charged with a weapons offense in New York. Our attorneys are former high-level prosecutors who have more than 60 years of combined experience working within New York’s criminal justice system. 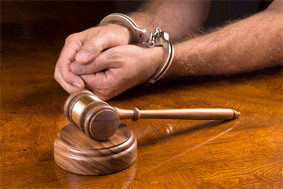 We provide the detailed and thorough criminal defense you need to protect your rights, freedom and reputation. In today’s anti-terrorism age, airport security has become increasingly vigilant and aggressive. If you have become the target of a criminal investigation for traveling with your gun or charged with criminal possession of a weapon, contact our New York airport arrest lawyers for a free initial consultation today.